I love these nuts. I could probably just stop there, end of story. However, these bite-sized glazed morsels are a little different in that the walnuts are first cooked in seasoned maple syrup and then tossed with spiced maple sugar. In a word: addictive. 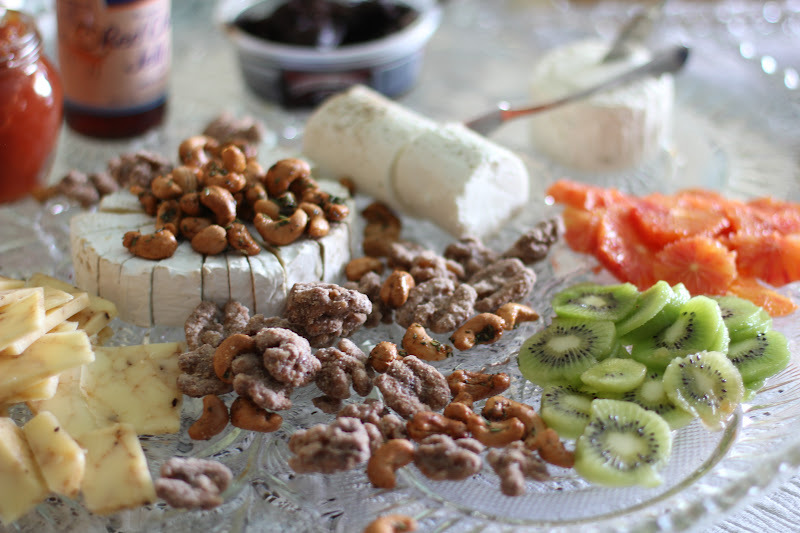 The walnuts are divine on their own, but then consider, if you will, a cheese tray. 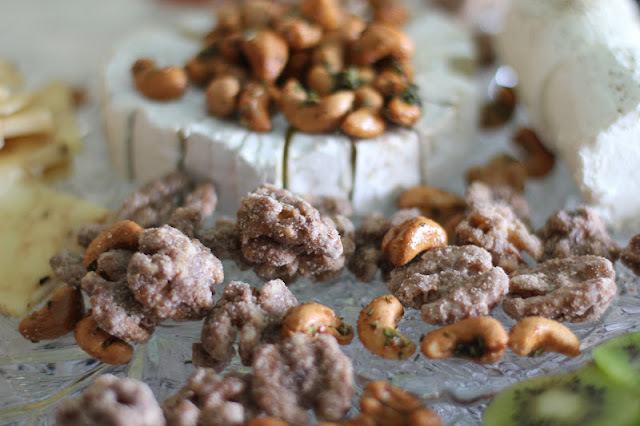 The sugared candied walnuts go perfectly well with brie and a variety of stronger tasting cheeses. This time of year, I like to add slices of peeled blood oranges, sliced horizontally to resemble flowers, and slices of peeled kiwi, with both fruits adding vibrant color and taste. When the holidays roll around again, the walnuts make a lovely homemade gift (that don't need to be made at the last minute), and are a nice addition tucked into a tray of cookies and candies. I also like the idea of accenting pieces of fudge with the walnut halves. Last, but not least, the walnuts are sensational added to salads. I recently enjoyed a divine Spinach Salad at The Cactus Club in Vancouver. In addition to candied nuts the exceptionally fresh salad featured: Italian prosciutto, cabbage, arugula, pickled beets, goat cheese, thinly sliced pears, sherry vinaigrette, shards of Parmigiano Reggiano and decoratively finished witha heavy drizzle of balsamic glaze. I can't wait to reinterpret this salad at home. One recipe. Many applications. Unleash your creativity! 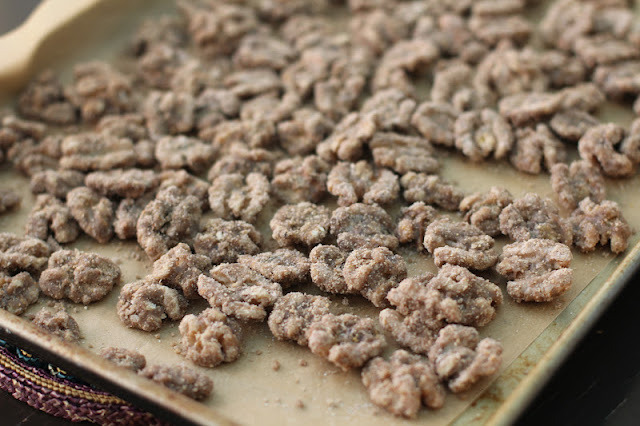 Over the years I have experienced inconsistent results with this recipe until the day I halved the wet ingredients and quartered the maple sugar-spice mix. To make a bigger batch, you will need to use a 16-inch skillet and a strong arm. Otherwise, settle on making smaller batches to ensure success. If I recall correctly, this recipe is adapted from Martha Stewart Living. I jotted down the recipe years ago and failed to note the issue from whence it came. The recipe is not posted on the Living website. One caveat... maple sugar is not inexpensive. I recently purchased a 5.25-ounce container for $12.99 at a duty-free shop at the Vancouver Airport. For non-splurge spending, Amazon is my consistent source for low prices and free shipping. You can purchase a larger 25-ounce container for about $21.00. The sugar keeps well in the pantry. A prior purchase kept me in maple sugar for several years. 2. Spread walnuts on a cookie sheet and toast in the oven for 10 minutes. Cool completely. 3. In the skillet, bring the maple syrup, Amaretto, butter and vanilla extract or paste to a boil over medium heat. Cook until the liquid is reduced by half, about 5 minutes. Stir in nuts, continue cooking and stirring until skillet is almost dry, about 3 to 5 minutes. 4. Remove from heat and immediately sprinkle the maple sugar mixture. Toss until well coated. Spread the nuts onto a parchment lined baking sheet to cool completely - about 2 to 3 hours in a dry environment, longer in humidity. In a glass jar at room temperature, the nuts keep very nicely for a couple of weeks. Across the walnuts and the wine." Never thought about doing them with maple syrup..which I adore and the ONLY thing that goes in my coffee. These are so nice to give at the holidays, too. For a bit of zing, in our part of the world, a shake of cayenne is pretty good, too.